The 7.62x39mm cartridge is among the first things that come to mind when the word assault rifle is used. Finding its most common application in the AK47 series and the SKS, the 7.62x39mm cartridge is ballistically similar to the 30-30 Winchester. This means that the cartridge is good for hunting medium game animals and is more than adequate for self-defense against human attacker(S). Due to the global distribution of an estimated 80 million rifles that can shoot this cartridge, it is reasonable to expect the ammunition for this cartridge to be near the lowest possible price due to the economies of mass production. Phrased another way, he is saying that extreme circumstances bring out all of the best and remove all that is of little or no value (base) in people. What matters, in the clutch, are reliable assets. This allows you to plan in as much detail as possible for a future that is not able to be completely and accurately foreseen. The people who designed the 7.62x39mm cartridge and the weapons that shoot it come from just such a background. Since 800 AD, the recorded history of Eastern Europe provides many examples of warfare, massacres and the food and supply shortages that always plague those not directly involved in the fighting. Simple is good because simple is reliable. And reliability is an asset more valuable than most other assets when the chips are down. 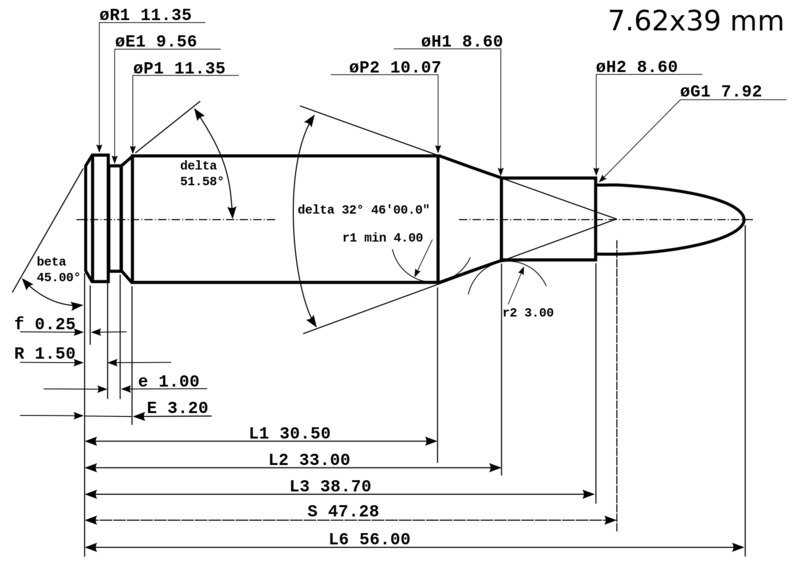 The 7.62x39mm has a diameter at the web of the cartridge of 11.35mm while the shoulder has a diameter of 10.07mm. This gives us a drop of 11.3% from the wide base to the narrower shoulder. 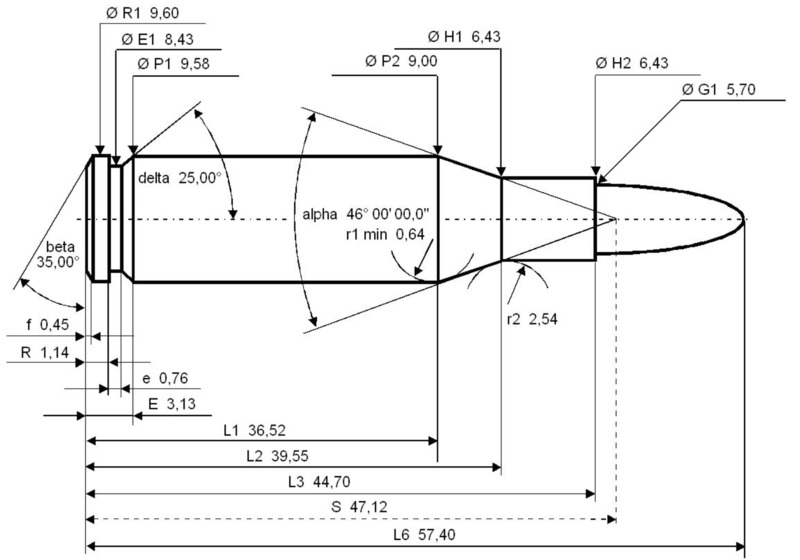 The 223 Remington has a diameter at the web of the cartridge of 9.6mm while the shoulder has a diameter of 9mm. This gives us a drop of 6.2% from the base to the narrower shoulder. The wedge-like shape of the 7.62x39mm cartridge allows the cartridge to enter a dirty chamber with much less resistance since there is no contact between the cartridge and the chamber until the shoulder of the cartridge slams to a rest in the chamber. Just the same, the large taper allows for easier extraction from a fouled chamber. Most full-metal-jacketed AK-47 bullets do not deform significantly on striking the body, unless they strike bone. They characteristically travel point-forward until they penetrate 9 to 10 inches of tissue (if a bullet yaws, turning sideways during its tissue path, it causes increased disruption). This means that most AK-47 shots will pass through the body causing no greater damage than produced by handgun bullets. For self-defense I recommend staying in the 123gr range for the JSPs and testing your ammunition in your gun, shooting into a valid ballistic medium to evaluate bullet expansion and weight retention.